Environmental protection is viewed as an important part of corporate policy at our company. We see it as our duty to prevent or reduce adverse effects to the environment. 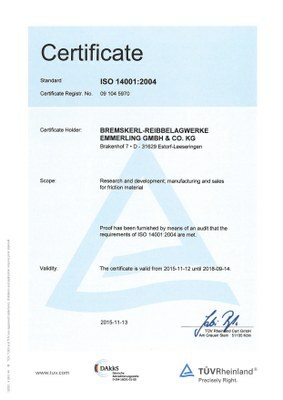 In order to ensure this we have implemented an environmental management system in accordance with ISO 14001. We can thus guarantee the legal security of our processes and products, the description of our activities concerning environmental protection, the identification of our environmental aspects, the specification of environmentally relevant goals and the assessment of the results in order to introduce measures for the constant process of improvement. We have employed representatives who, thanks to their specialist knowledge, ensure that the statutory and regulatory requirements relevant to us are recognised and implemented. This also has an effect on our development, ordering, production and logistic processes. We are able to ensure their environmental compatibility through specified procedures. The risk potential of our facilities is also inspected on a regular basis in order to prevent accidents and environmental disasters and to take preventative measures if necessary. We train and inform our employees in order to promote and sharpen their environmental awareness inside and outside the company. An open dialogue with employees and authorities is an important task for our company. We influence our suppliers and contracting partners in order to ensure that our contractual partners also operate in an environmentally friendly manner. Companies who work on the company premises in particular are contractually obligated to comply with our requirements. This environmental policy is published on the Internet and intranet. For the pdf. version click here.